First there was company, then no company, then company again. By the end, I was kind of "done" with the whole idea of cooking dinner. Still, we had to eat, right? Finally, I just decided to do the simplest possible preparation of one of my Kosher Pastured Chickens from Grow and Behold. This time. 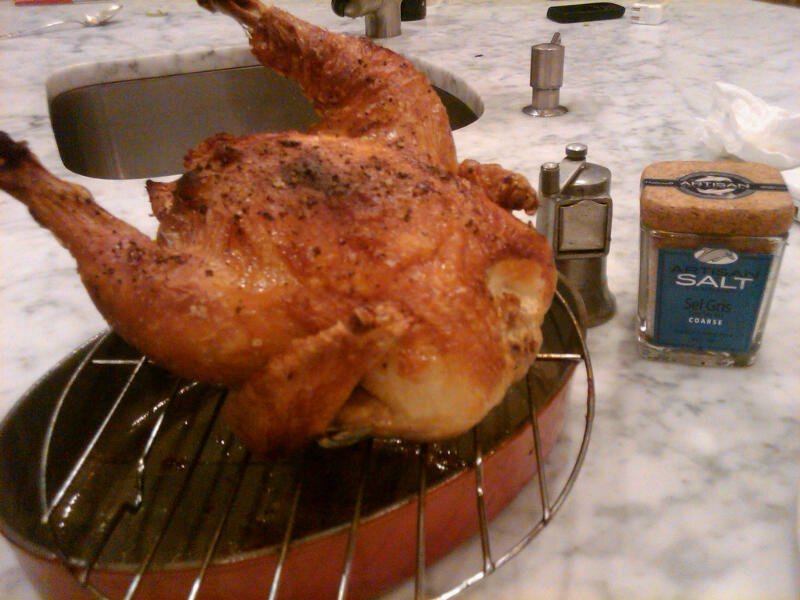 Just sea salt, pepper, and the delicious tiny chicken. I know that you know that I know how to truss a chicken tidily... this is just SIMPLE. No trussing. How simple? Preheat your oven to 450 degrees, convection roast, if you have that option. OVEN. HOT. (Simple, right?). Rinse the chicken, remove any innards and/or excess fat. Salt and Pepper heavily inside the cavity, and outside the bird (drizzle a bit of olive oil to help it stick if you want). Now, the trick I love is this: Roast the chicken suspended on a rack over a baking pan. this allows the hot air to circulate all around the chicken, crisping it to perfection. Roast until the meat around the drumstick is no longer pink. For a small bird of 3-4 lbs. it will take about 50 minutes to an hour. 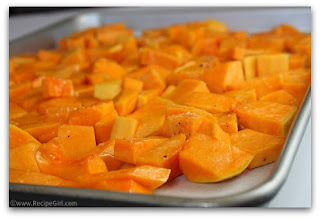 Along with the simple theme I chunked up butternut squash, and drizzled it with maple syrup and more salt and pepper. Baked in a pie pan right next to the chicken. and if you are lucky, you will have a couple of slices left tomorrow for a chicken sandwich on rye toast with a slice of an heirloom tomato.